The Australian Transport Safety Bureau (ATSB) has begun investigating the crash of an Erikson Aircrane helicopter while fighting bushfires in eastern Victoria. The incident occurred on Monday, January 28, with the Helitak 341 N173AC ending up in a dam near Jericho in Victoria’s Gippsland region. The aircraft was involved in fire suppression activities in the Thomson Complex Catchment. The two pilots and one engineer on board the aircraft survived the incident. In a short statement on its website, the ATSB said it had commenced its investigation into the crash. “During aerial fire control operations, at about 1956, the helicopter collided with water and came to rest inverted resulting in minor injuries to the three crew and damage to the helicopter,” the ATSB said. The ATSB said it expected to complete the investigation and issue a report by the third quarter of calendar 2019. However, should a critical safety issue be identified during the course of the investigation, the ATSB said it would “immediately notify relevant parties so appropriate action can be taken”. All Erickson Aircrane helicopters working in Australia were grounded following Monday’s accident. However, Kestrel Aviation, the company that manages these aircraft, told the ABC on Wednesday the grounding had now been lifted. 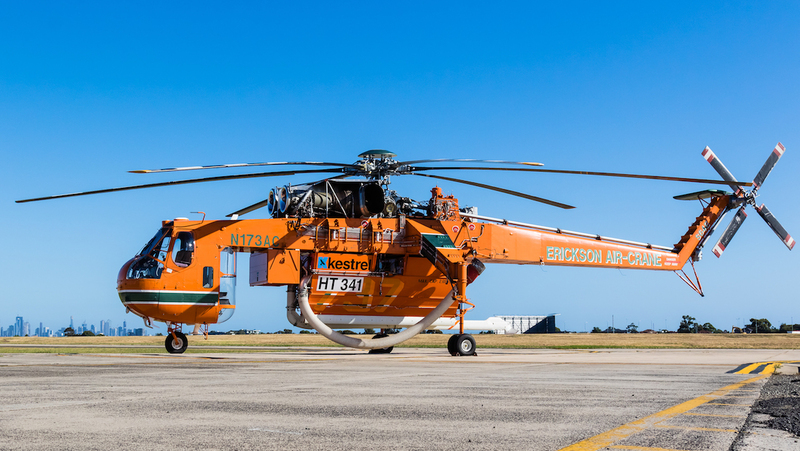 “The Aircranes will return to service almost immediately,” Kestrel Aviation managing director Ray Cronin said. “The crews are with the aircraft ready to rejoin the fire fight in Victoria. Cronin said the grounding was a precautionary measure, adding that the Erickson Aircrane was a very reliable aircraft. There are five Aircranes flying in Australia – two in New South Wales, one in South Australia and one in Western Australia, as well as a second aircraft in Victoria. Meanwhile, Channel Seven had video footage of where the aircraft ended up on its Twitter page. Has that downed Erickson Air Crane helicopter which crashed into the Thomson salvaged? That is; has it been lifted out of the Thompson Dam yet?